Khirbat Palace remains a unique example of Umayyad luxury and their developed taste for art. The palace gained particular reputation due to the well-preserved floor mosaics. Figure 1. The Palace complex showing different sections of the plan. Among the many monuments of Islamic civilisation, the types of buildings that survived least were palaces and private domestic buildings. Those which have reached us are mostly in poor condition. This curious phenomenon is mainly connected to the cultural perception which gives these types of buildings the lowest priority to preserve when compared to religious, educational or civic buildings built by various caliphs. The other factor to account for this lack of preservation is political: Palaces were often the scenes of attack and destruction by political opponents. Most palaces were destroyed in vicious acts of revenge immediately after the fall from power of the previous emir or sultan. As an example we can cite what happened to Madinat Al-Zahra in Cordoba at the hands of rebellious Andalusians. This may explain the fate of great palaces such as the Umayyad palaces in Syria, Jordan and Palestine, the Abbasid's in Iraq and Fatimid's in Cairo. Consequently most of the available information about Muslim palaces is from literary sources, or archaeological surveys, rather than fully preserved buildings. Among these ruined palaces is Khirbat Al-Mafjar, which is the subject of this short description. The palace complex of Khirbat al-Mafjar was built near Jericho during the reign of Caliph Hisham Ibn Abdelmalik between 724-743 CE. It can be dated by a marble inscription found on the site written by a certain Ubayd Allah which invokes the name of this caliph. Hisham is known to have built a number of palaces including Qasr Al-Hair Al-Gharbi, Qasr Al-Hair Al-Sharqi, Qasr Rusafa. However, these palaces were all located in Syria and there is no historical record of Hisham having visited Palestine. These facts support his successor Al-Walid II as the patron and owner of the complex . Al-Walid II is renowned for his luxurious lifestyle spending much of his time in hunting, partying and visiting the vast country as far as Palestine and Jordan. This lifestyle was supported by a number of palaces including Khirbat Al-Mafjar, Mshatta and Qasr at-Tuba. To resolve the issue of the marble inscription, an explanation has been put forward suggesting that prince Al-Walid II was the real patron of the palace while he was the heir to the throne. The palace was unfortunately abandoned in an incomplete state in 747 CE after a destructive earthquake. A look at the plan of the palace complex reveals the height of sophistication reached in late Umayyad architecture. The whole design scheme was incorporated in a rectangular enclosure protected by strong walls supported by circular towers at equal intervals. The scheme was arranged in four main sections. The domestic section, that is the palace proper, is a two-storey structure occupying the southern side of the complex. 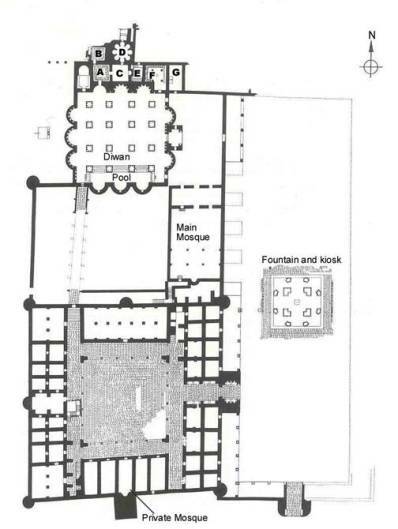 It has a symmetrical plan ordered around a large courtyard, containing a succession of rooms isolated from each other and arranged in pairs along the eastern and western sides. At the eastern end, the centre of these rooms was transformed into an entrance hall connecting with the porch. At the opposite end this space was made into a single room barrel-vaulted in brick. At the centre of the southern enclosure is a rectangular structure composed of five equal rooms; the central room has a niche (mihrab) in the southern wall behind which there are remains of a square minaret. This is the domestic mosque and was most probably reserved for the household of the prince. At the northern end of the domestic section there is a large room of a size equal to the five rooms of the southern wall. In the centre of this room there are the remains of six piers which must have provided the support for six arcades of two arches each, which in their turn must have supported the vaults of the roof . 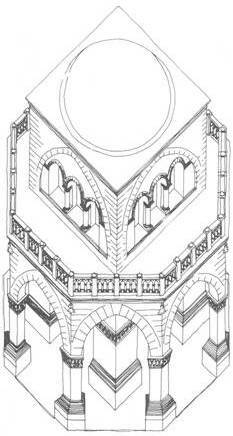 In the cloister of the west side was a double-landing staircase leading down to a sunken court preceding a vaulted crypt lit by triple windows. This was the so called Serdab (literally in Persian "cold water"), a room for keeping cool on summer days . Next to the north lies another section containing the main mosque and its courtyard. The mosque occupies the eastern side comprising a large room of two aisles raised by eight piers arranged parallel to the mihrab wall (qibla). At the back is a small section in the form of a narthex accessed by three doors. The third section encompasses one of the largest and most magnificent baths found in the Muslim world. The structure is approached from the west by a richly decorated porch, with the statue of the Caliph standing over a platform of two symmetrical lions fitted in a concave above the centre of the portal being its most significant feature. Evidence from the design of the hall shows that Al-Walid II indeed lived in a lavish luxurious style. The bath's main room, the frigidarium, is a hall of generous proportions carried on sixteen composite piers supporting the domes and barrel vaults which made up its roof. The bath is believed to have been adequately lit by clerestory windows like a Byzantine building. The other significant feature is the presence of the so called "exedrae", semicircular apses, flanked by a pair of engaged columns which were inserted into the four external walls. These exedras were crowned with semi-domes. This theme was also reflected in the lobed corners of the pier plans. The centre of the bath is crowned by a great dome rising above the eight surrounding vaults which in turn rose higher than the apsidal walls. The huge space is subdivided into three functional sections. An oblong pool, of over 60 feet in length, was set along the southern side of the bath, approached by steps in the western corner indicating that it must have been the private access of the prince. Behind is a hall that had a ceremonial function and which may also have served for banquets, a hypothesis confirmed by a picture of a knife, gourd, and leaf depicted in a mosaic at its focal head. From the rich decorative material recovered from this hall which exceeded that found in any other room, it has been established that this was the Diwan or the audience hall. The location of this Diwan in this area of the palace can be interpreted by the desire of the emir or caliph to separate himself from political pressures by meeting his advisors in such a relaxing atmosphere. The other is perhaps to screen his visitors by keeping them away from the entrance of the palace, allowing only the closest to reach him . The bath proper comes behind the ceremonial hall, connected with the hot and cold rooms through doors in its northern wall. Excavations revealed the existence of two cold rooms that were connected to the frigidarium and equipped with benches all around the walls. There were also two hot rooms (furnaces) facing each other and connected through a door. The most peculiar of these hot rooms is the second room situated north of the first furnace. It is a circular chamber made of eight horseshoe-shaped apses with semi-domes . The furnace, placed under the niche, was accessible only from the exterior. The hot air was carried up the walls by a connection of short pottery pipes hidden by marble panelling . To the east of the hot rooms are the latrine rooms equipped with benches and seating slabs. The last section of the palace complex was the forecourt which ran north-south along the whole eastern side. Paved with flagstones, this large court must have provided adequate space for a number of royal sports activities. At its centre archaeologists discovered the remains of a domed monumental kiosk, which was built above the fountain. Such provisions are reminders of the "dome of heaven" (qubat al-khadra), an architectural feature introduced in association with paradise . The other spectacular aspect of the palace is its decorative scheme which incorporated a wide variety of themes executed by a collaborated effort of Muslim and Byzantine craftsmen . The decorative scheme involved a variety of themes and methods. The use of architectural forms to create the majestic atmosphere of the palace was very successful at incorporating impressive domes, apses and vaults, niches, colonnettes and a full range of elaborate entablatures, moulds and decorative string-courses . Figure 6. Panel of Mosaics of the Diwan resembling those of the Great Umayad Mosque of Damascus (715 CE). 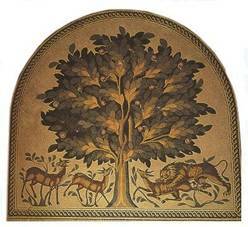 The lion and gazelles were integrated in later Muslim art especially in textile and carpet designs. The second decorative method was the fully finished marble and carved stucco which were used extensively in the reception room and other parts of the palace. Also found here is one of the earliest uses of delicate geometric window grilles, made from plaster carving; probably imitating the marble grilles of the Great Mosque of Damascus (715 CE). Another delicate work appears in the central ceiling rosette which once adorned the ceiling of the reception room and which was fortunately recovered complete from the debris. It is a six lobed rosette composed with six large acanthus leaves in its centre. At the lobes three alternating male and three female heads of Arabian features were fixed. Another area where carved stucco and geometrical grilles were used is in chancel screens which served as balustrades to protect the stair wall, and were also inserted between columns of the upper floor galleries and the portico surrounding the centre and the forecourt. Their rectangular plaster slabs were engraved with medallion designs containing grape-inhabited scrolls, continuously generating floral meanders, inter-looped straps forming rosettes staged in oblique runs or disposed in complex multiple figures. The design in the face of the panel differed from that of the back and each panel was repeated only once in the whole scheme . 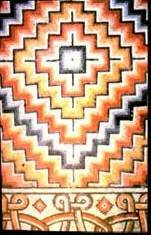 The other decorative means was the extensive use of mosaics. 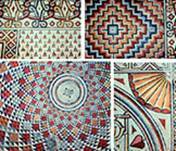 The mosaics which cover the entire frigidarium floor are preserved in surprisingly good condition. These mosaics were made of coloured limestone arranged in 30 panels of variant geometrical patterns incorporating concentric lozenges, surrounded with pearl band borders and circles inter-looped at the meeting of their quadrants. The floor of the centre of the hall is covered with a great medallion composed of radiating intersecting arcs of expanding diameter. The whole mosaic scheme was presented like a series of carpets fitted together without a prearranged order. Another impressive decoration is found in the Diwan consisting of a semicircular frame enveloping a leafy fruitful tree motif. The colours chosen to represent the foliage were blue and green. More importantly, is the scene depicted below the tree. At one side there is a ferocious lion leaping on a gazelle and symmetrical to this on the other side are two gazelles grazing. This scene was to become a very popular motif used in textile and carpet designs as well as many ivory works in many parts of the Muslim world. The tree itself resembles the mosaics executed on the façade of the Great Umayyad Mosque of Damascus, both of Byzantine and Roman origins . The fourth means of decoration was the surprising use of figurative representations and sculpturing. Medallions containing freely modelled sculptural figures were positioned in niches and supporting pendentives. The most distinguished of these is the statue of the Caliph referred to above. The study of other assembled debris revealed the presence of animal depiction namely involving hurrying hounds amid intertwining vines and full-breasted birds with combed heads and dainty plumage. It was unfortunate that this majestic palace was destroyed before it was completed, but it remains a unique example of the Umayyad luxury and their developed taste for art. The palace gained particular reputation due to the well-preserved floor mosaics which are considered as one of the most complete schemes found so far. 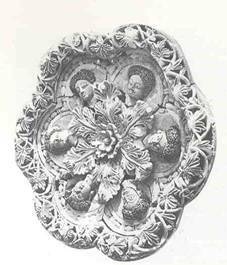 The presence of figurative depictions in sculpture and carving is also a rare example of their use in Muslim art. Hamilton, R.W. (1959), ‘Khirbat al-Mafjar: an Arabian mansion in the Jordan Valley', Oxford. Creswell, K.A.C. (1989), ‘A Short Account of Early Muslim Architecture', Revised and supplemented by James, W. Allan, Scolar Press, p.183. Hillenbrand, R. (1994), ‘Islamic architecture: form, function and meaning', Edinburgh: Edinburgh University Press., p.382. Creswell, K.A.C. (1989), ‘A Short Account of Early Muslim Architecture', op cit., p.199. Hamilton, R.W. (1959), ‘Khirbat al-Mafjar: an Arabian mansion in the Jordan Valley', op., cit. Michell, M. et al. (eds.) (1978), ‘Architecture of the Islamic World', Thames and Hudson, London, p.236. Hamilton, R.W. (1959), ‘Khirbat al-Mafjar: an Arabian mansion in the Jordan Valley', op cit., p.257. Hamilton, op. cit., categorised them in seven groups; Rectilinear diapers or reticulations, Interlacings on rectangular grid, Concentric interlacings, Sprig patterns, Rainbow matting patterns, Basketry patterns, and Overlapping circles. See Creswell, K.A.C. (1989), ‘A Short Account of Early Muslim Architecture', op cit., p.193. Rice, T.D. (1975), ‘Islamic Art', Thames and Hudson, p.22.